The Skinny: Unofficial prequel/sequel to Jackie Chan's popular Drunken Master film that focuses on the life and times of Beggar Su and his longtime friend, Fan Ta-Pei. 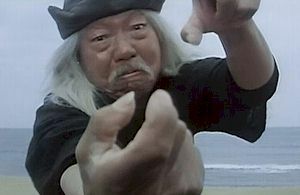 McMillin: Though a young Wong Fei-Hung served as the protagonist of Yuen Woo-Ping's 1978 hit Drunken Master, the most endearing character of the film would have to be his comical sifu, Beggar Su Hua-Tzu (Simon Yuen). Also known as "Sam Seed" in English dubbed versions of the film, Beggar Su ranks highly among the many iconic figures of martial arts cinema. Naturally, in a blatant attempt to capitalize on the box office success of that early Jackie Chan classic, director Joseph Kuo resurrected the character for this semi-sequel. Though Simon Yuen is featured prominently on the poster art (with no less than three images), he only appears briefly in the credit sequence as he demonstrates the art of drunken boxing. Once the film proper begins rolling, however, two other actors replace Yuen for the remainder of the film. It's a big disappointment for Drunken Master fans, considering the obvious charm Simon Yuen brought to the role, but the film does its best to make up for his absence. The plot starts out simple enough: after a thirty year hiatus, Beggar Su and Fan Ta-Pei (Jack Lung in old age makeup) meet once more. The circumstances are mysterious; each has been invited for a drink at a seemingly abandoned outdoor eatery, but both think the other has requested the meeting. After some preliminary "Let's reintroduce ourselves!" fisticuffs, the two end up downing a few shots of expensive wine and reminiscing about their adventure-filled pasts. Here the narrative shifts to the duo's mischievous teenaged years, when the two bickering con artists joined forces to swipe some grapes from the local vineyard. However, the two are soon caught by Chang Chi (Chan Wai-Lau), who promptly puts the two to work for the winemaker. But, after learning that the two scamps tried unsuccessfully to help some locals fend off the evil Tiger Yeh (Lung Fei) and his dastardly cronies, Chang Chi decides to teach Su and Fan the secrets of drunken boxing. As is customary with martial arts films, our young heroes then undergo some vigorous, oftentimes humorous training exercises and compete, albeit somewhat vaguely, for the affections of the local beauty, Yu-Lu (Jeannie Chang). But when Tiger Yeh seeks out Chang Chi to avenge an old grudge, IT ALL GOES TO HELL! The outcome of this battle eventually explains the thirty-year separation of Beggar Su and Fan Ta-Pei and the subsequent mystery of their reunion.